The report also found that activists have been targeted by systematic surveillance, arbitrary arrests and violence. Assassinations targeting human rights activists in Brazil increased by a total 22 percent in 2016, according to a new report published on Tuesday by the Brazilian Committee for Human Rights Defenders (CBDDH). The report attributed the recent surge in violence due to harsh fiscal austerity measures and the elimination of several state institutions that were created in order to ensure the protection of vulnerable and marginalized communities. During the first half of 2017, 42 people were killed, which doubles the total tally of people killed during the same period last year. “Brazil currently finds itself in situation with perpetual structural violence. Meanwhile, the impunity of human rights violations in the country’s rural areas effectively guarantees repression and will undoubtedly increase the number of people that are killed and threatened,” The CBDDH stated in it's investigation. The findings from the report revealed that the majority of the assassinations are mainly centered in the country’s rural areas. However, the CBDDH highlighted the fact that violence and repression is not limited to rural activists. 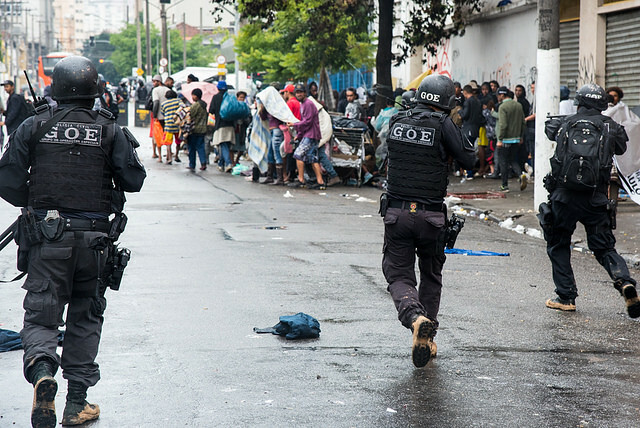 The report also discovered systematic surveillance, arbitrary arrests and violence carried out by private security companies along with the Brazilian Military police, which directly target city-based activists and urban social movements. “This is only possible due to the links between private and public security forces. In the urban setting, this is particularly evident, in cities like Rio de Janeiro and São Paulo, where there has been systematic and institutionalized surveillance of social movements and protesters,” said Alice de Marchi, a researcher with the Brazilian-based human rights advocacy group Justiça Global. The report also argued and identified several legislative measures such as the country’s National Security Law, which the authors contend is being used as a legal pretext to justify arbitrary arrests and violence against members of social justice movements. During the previous year, the CBDDH documented a total of 64 cases involving the criminalization of Brazilian social movements.